The popular GoPro Hero sports camera is getting a real nice upgrade. On Tuesday, GoPro announced the launch of the new GoPro Hero+ LCD, its first ever entry-level camera to feature a touch-screen LCD display. The basics of the camera are solid. The Hero+ LCD records video in 1080p60, and takes 8 MP resolution stills, both recorded on a microSD card (up to 64 GB). Because it was designed for use during action sports like surfing and skiing, the camera is both rugged and waterproof. Video recording can be started with a single button press (a great feature for those pressed for time to catch a shot), and a HiLight Tagging button allows you to flag certain moments in a video as you record them so you can easily find those moments later during playback. That’s all well and good, of course, but the show stopping feature here is the LCD screen – a first for GoPro’s entry-level Hero camera. It allows you to access camera settings, frame your shots and watch video playback, all from the camera itself. There’s an new in-camera video trimming feature for tidying up your clips on the spot, too – handy for when you want to share short videos via the camera’s built-in Wi-Fi or Bluetooth connections. 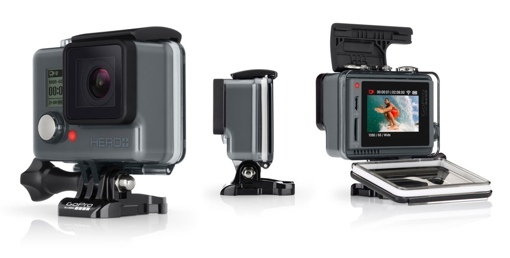 The GoPro Hero+ LCD will be available for purchase starting June 7, 2015 here in the United States; international readers will need to wait until mid-July. It carries a MSRP of $299.99. For more information about this camera and the rest of the GoPro camera line, visit gopro.com.